When you first walk into this eatery, which is the on-site restaurant of the trendy OUT NYC Hotel, you will notice trendy decor, plenty of light and lots of white! The restaurant serves up contemporary Italian fare at a very reasonable price. Their menu mainly focuses on salads, pizzas, meat dishes and plenty of fresh seafood. Every salad or pasta has the option of adding chicken, fresh salmon, shrimp or steak. Everything from the bread to the sauces are freshly made in-house which makes each dish a very delicious experience. We started off with a fresh salad, of which there are plenty of options from Caesar to Kale. If you are fan of anchovies you will love the Caesar salad. Our favorite was the Kale Salad, which included mint, cilantro and was tossed in a lightly spiced peanut dressing! 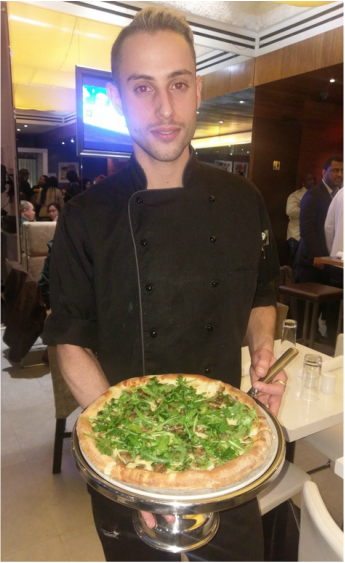 KTCHN serves a wide variety of Pizzas with fresh toppings and Pastas. The pizza selection includes Margherita, Pepperoni and Prosciutto and Wild Mushroom (which is not on the menu). You can add additional toppings to your pizza selection which include items such as bacon, truffle oil and fresh mozzarella. We tried the Wild Mushroom Pizza which is absolutely divine, it featured a thin crust, a delicious variety of mushrooms and a delicious sauce. The pasta selection does not disappoint, they have everything from Spaghetti and Meatballs to Fettucini Carbonara. Our favorite was the Orecchiette Pasta which was the perfect blend of pasta, Italian sausage and broccoli rabe! KTCHN features a decadent selection of desserts. If you are a chocolate lover, we recommend the Warm Dark Chocolate Cake, for those that crave a lighter dessert we recommend the Poached Pear. KTCHN Serves up a delicious range of fresh salads from Caesar to a House Salad. Our recommended salad is the Kale Salad which included mint, cilantro and was tossed in a lightly spiced peanut dressing! KTCHN has a great selection of pastas that range from Spaghetti and Meatballs to Fettucini Carbonara. 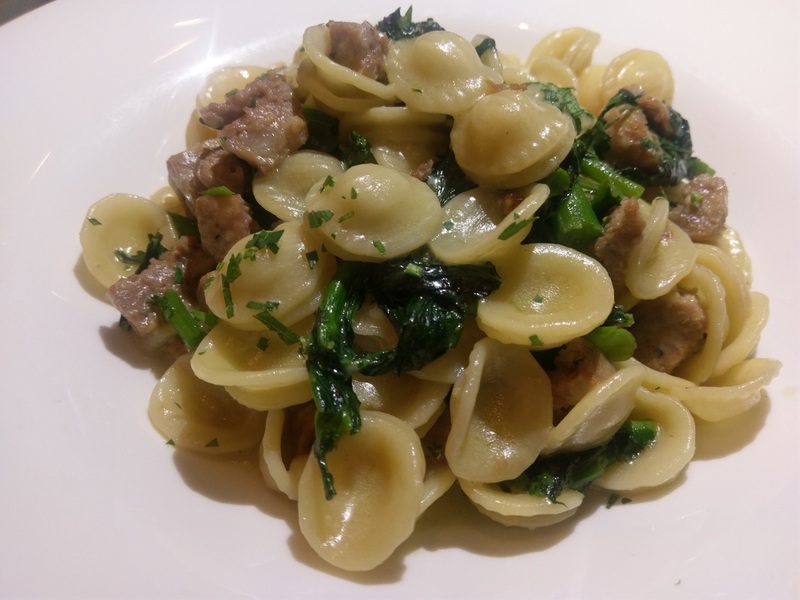 We highly recommend the Orecchiette Pasta which has the perfect blend of pasta with Italian sausage and broccoli rabe. We love desserts, that's why we loved KTCHN's selection of decadent desserts. From Tiramisu to Warm Dark Chocolate Cake. One unique dessert they feature is the Poached Pear. It is a pear that is drenched with port wine reduction and includes a scoop of vanilla ice cream!